Bike computers have come a long way over the past few years, with the high end options now looking and performing more like smartphones than the basic devices most people are familiar with. Some of these new features are game changers, while others may not be necessary for every rider. The best option for you will depend on what you are looking to get out of your device. 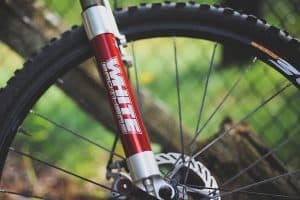 Below are the key considerations you should keep in mind when on the market for a bike computer. This is really the key functionality of your bike computer. All of the products in this article provide GPS enabled turn-by-turn directions. Some of them allow direct input and alteration of routes, while other require this to be pre-loaded via and computer or smartphone app. Most serious cyclists want to track performance metrics like heart rate and cadence. 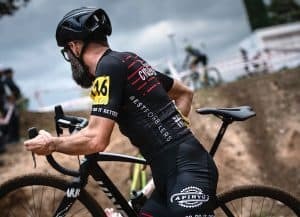 You therefore want a bike computer that integrates well with other measurement devices on your body or bike, as well as social apps like Strava. A fairly new addition in the world of bike computers is the touchscreen. While the premium devices do come with this functionality, not all riders are sold on the usability and prefer the old-school side buttons. Are you going to prioritise a big screen over aerodynamic design? Do you want a small rugged device that can withstand crashes or would you prefer a large touchscreen interface? 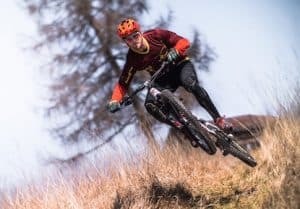 These are important questions to answer in your search for the best bike computer to suit your needs. One of Garmin’s premium bike computers, the 820 offers the very best in GPS navigation and performance tracking, along with industry leading route technology and race functionality. The 820 is the same size as the 520/520 Plus, but offers enhanced navigation features and a touchscreen interface. It also provides advanced metric tracking, including integration with heart rate monitors, as well as speed, power, and cadence meters. Like the 1030, the 820 allows the input of locations directly into the device via the touchscreen, while most other devices, including the 520 plus, require these to be pre-loaded. It has 16GB of internal memory, built-in incident detection, strava live segments, and a range of other features to make sure you get the most out of your training and racing. A high-end bike computer that is loaded with features and is great for training, racing and navigation. Similar in size to the 820, the 520 Plus is a big upgrade from the very popular 520 model. 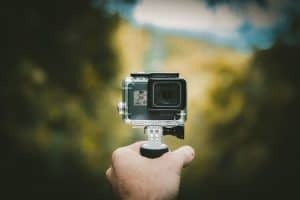 GPS navigation functionality is impressive, however unlike the 820 and 1030, routes must be pre-loaded and cannot be directly entered into the device. 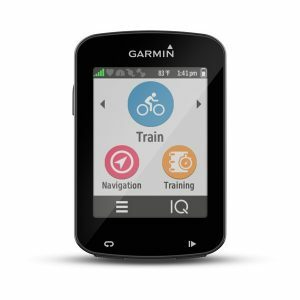 The 520 comes preloaded with Garmin Cycle Map with turn-by-turn directions for on and off road courses. It is also preloaded Strava Live Segments that let you compete second by second with your, or another riders previous best or PR, with real-time results available on your screen. Pairs with compatible indoor trainers for data display and control. Unlike the 820 and 1030, the 520 Plus operates via buttons on the exterior of the device as opposed to touch screen. While the lack of touch screen functionality may seem like a sacrifice when compared to Garmin’s more premium offerings, it is worth keeping in mind that many riders actually prefer buttons to touch screens, especially when fingers are wet/sweaty. Battery life is an acceptable 15hrs. 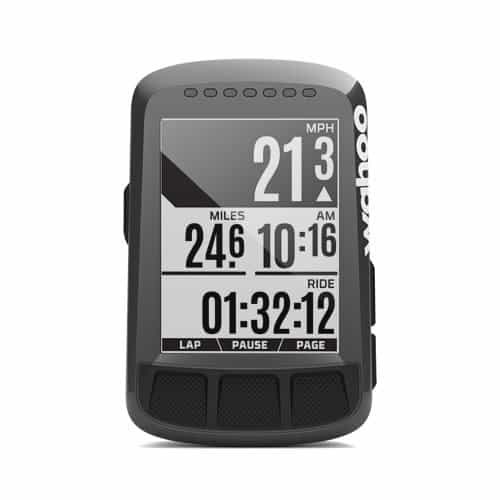 Another very popular bike computer, the Elemnt Bolt from Wahoo presents strong competition for the Garmin 520. It provides great navigation for pre-loaded routes and allows for integration with heart rate monitors and cadence sensors. It also provides a plethora of other performance and tracking features as you would expect from any high-end bike computer. Users love the Elemnt Bolt for its ease of use - both in it’s set up and in-ride functionality. Like the 520, navigation routes must be pre-loaded and cannot be entered directly into the device. Unlike the 520, the screen is black and white. 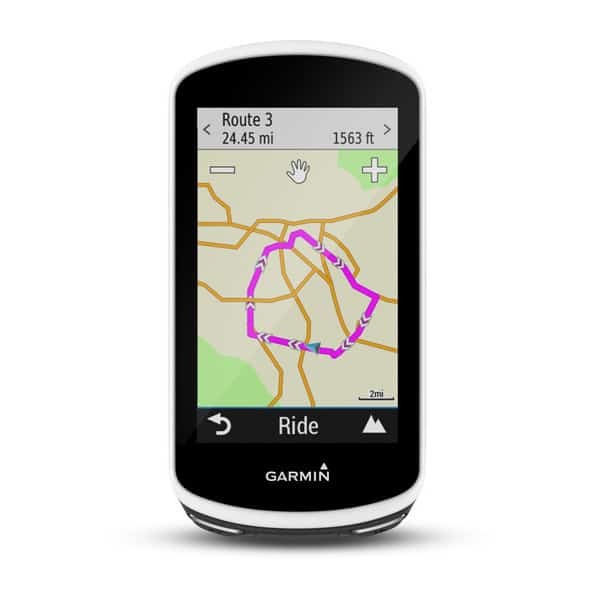 ​Garmin’s premium bike computer, the 1030 provides best-in-class navigation, allows for a range of route options and functionality, and records almost every metric under the sun. Further to being feature packed, it has great battery life (20hrs, with option to expand to 40hrs with additional power pack) and a large, bright, coloured touch screen. It also comes with a Micro SD slot for expandable storage. 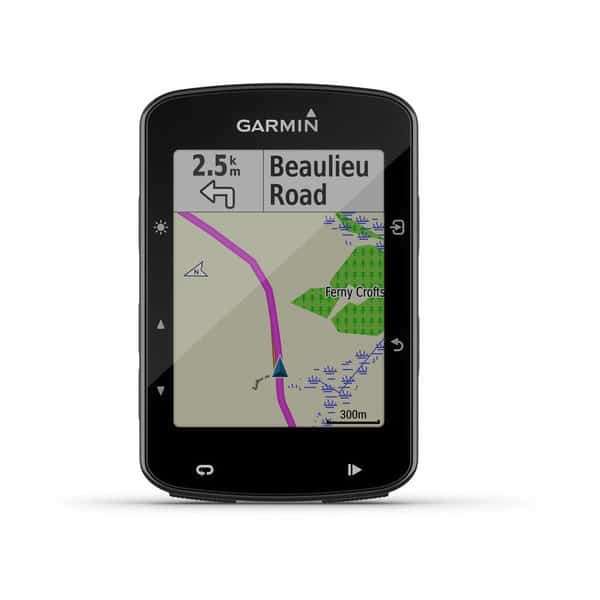 Garmin’s Trendline™ allows you to view popular routes based on billions of miles of Garmin Connect™ ride data to show the best on- and off-road routes. A rider-to-rider messaging feature lets you stay in contact with other cyclists in your group, while pre-loaded Strava Live Segments allow you to challenge yourself and others throughout your ride. 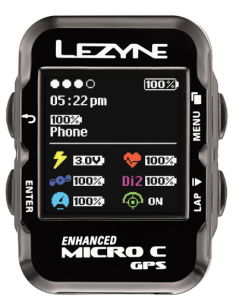 A much more affordable option than the others on this list, the Lezyne Micro Cycle GPS still represents a high end navigation and performance tracking bike computer. It is compact, easy to use, and trusted by thousands of serious cyclists around the world. Routes are loaded via Lezyne’s easy to use app, which also offers great integration with Strava. The turn-by-turn navigation is impressive, while additional performance data can be made available and recorded when paired with ANT+™ or Bluetooth Smart enabled power meters, heart rate monitors and speed/cadence sensors. Incoming text messages and calls are displayed directly on the screen. The best bike computer for you will really depend on what you are looking to get out of your device. 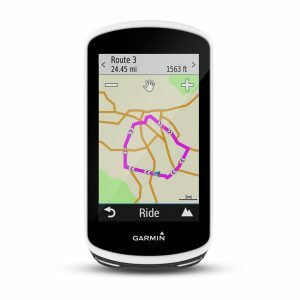 If we had to choose one, we’d go with the Garmin 820, as it offers the advanced GPS navigation and performance metric tracking of the 1030, with the compact design of the 520.